Any time any of my music friends start preaching the Gospel of Vinyl -- how it's so rich and pure and the only way to listen to music, blah blah blah -- I say "humbug!" Why stop at vinyl records? Let's go all the way and bring back the wax, or even the tin cylinder! 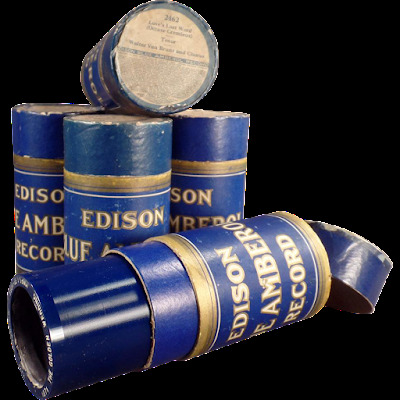 Actually cylinder recordings, popularized by some guy named Thomas Edison, don't always ound that great. But the good folks at the UCSB Cylinder Audio Archive have done a great job of collecting and in some cases, cleaning up the sound on these ancient recordings, though a few still are marred by scratches that sound like an Army marching over a field of potato chips. From the first recordings made on tinfoil in 1877 to the last produced on celluloid in 1929, cylinders spanned a half-century of technological development in sound recording. As documents of American cultural history and musical style, cylinders serve as an audible witness to the sounds and songs through which typical audiences first encountered the recorded human voice. And for those living at the turn of the 20th century, the most likely source of recorded sound on cylinders would have been Thomas Alva Edison's crowning achievement, the phonograph. Edison wasn't the only one in the sound recording business in the first decades of the 20th century; several companies with a great number of recording artists, in addition to the purveyors of the burgeoning disc format, all competed in the nascent musical marketplace. Still, more than any other figure of his time, Edison and the phonograph became synonymous with the cylinder medium. ... Nonetheless, Edison's story is heavily dependent on the stories of numerous musical figures and sound recording technological developments emblematic of the period, and it is our hope that we have fairly represented them here. This site has hundreds, if not thousands of digital recordings of cylinders from all over the world. Below is a small sample of four songs I like recorded between 1906 and 1920. For reasons unknown to me, the UCSB folks won't let you embed their songs, so I found versions that are on good old YouTube. But click the links to find out more about these songs, and by all means explore this site.